His name was Burhan Uddin Auliya Gharib and he is resting in Khudabad Sharif and he is one of the pious personalities of Aurangabad. His name is famous and well known as Burhan Uddin Gharib. He was well connected with two gengeogical records. He was contacted by 11th generation with Imam Abu Hanifa and in 21th generation he was connected with the Allah’s final apostle. He was pledge to Khaja Nizam Uddin Auliya and obtained the saintly dress from .He belongs to devotees of old pious personalities. He was the elder brother of Hazrat Muntaqab Uddin Zari Zari Baksh. So for this reason the people of Khuldabad called his shrine as a big shrine (Dargah). Upon the death of Hazrat Muntaqab Uddin as per his spiritual master’s instruction he came to Khuldabad from Delhi. As per reference from the book ‘Roudha Al-Aqtab’ Hazrat Burhan Uddin was born in the year 654 A.H. In city Hansi and his parents used to call him as Burhani instead of Burhan Uddin. His father’s name is Sheikh Mohammed and his mother’s name is Bibi Hejira. His grave is situated in the tomb which is located in the compound in the western-northern side. Sheikh Mahmood had 4 sons and 5 daughters and among all of them Burhan Uddin was the elder son of his parents. Since long time he has been much interested to learn alchemy so he was searching a perfect Sheikh in this matter. Due to his search he left Hansi city and reached in Delhi and at that time he was passing through poor conditions of his life. 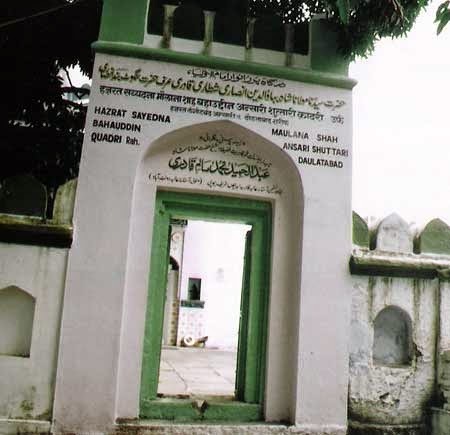 Hazrat Zain Uddin who was his Murid ( disciple) and his caliph and he says that when he left Hansi city and reached to Delhi and where he stayed in one deserted mosque which was situated near a bridge and due to his blessing it was lighted and a large number of people started to come to that mosque. At that time there was great fame and name for the favor and attention of Hazrat Nizam Uddin Auliya’s general eating cloth and his public kitchen were famous in the all over the world. When he heard about the events of the Sheikh’s perfection and general favor then he used to think in this matter that on trust of Allah it is not possible such great eating cloth for poor persons and even for the kings and for others without alchemy and invisible hand it is not possible. But he was not known that Sheikh’s tongue will work like alchemy and the eating cloth was due to kindness and grace of Allah. Whoever will be entered in a shrine will become like philosopher’s stone not like an alchemist. So in this way in his search of his interest in alchemy he was entered in the shrine of Hazrat Khaja Nizam Uddin Auliya. Upon seeing his worst poverty condition Sheikh’s special servant told the Sheikh that Burhan Uddin Gharib presented here and upon learning this the Sheikh told that the general persons known him well but he is still poor . So from that day he was become famous and well known with the title of Gharib. Upon hearing his Sheikh’s instruction Burhan Uddin left his thinking to learn alchemy in this matter and he began his interest in indigence. He came from Ghiyaspur to Delhi in the year 693 A.H. At that time there were following two persons were there in the service of Hazrat Khaja Nizam Uddin Aulia. Hazrat Kamal Uddin Yaqub (his grave is situated in Patan Gujrat). As per reference from the history book ‘Tariq Farista’ that once he was sitting on the earth in the public kitchen. Due to too much cold he spread his kitchen’s small mattress which was on his shoulder on the earth and he sat on it. For this reason someone had complained in this matter with Hazrat Nizam Uddin Auliya that Burhan Uddin Gharib used to sit in the public kitchen on the small mattress . Upon hearing this the Sheikh told that it is not good and still in his head lust is there. So for this reason he asked him not to come into his presence. When he heard the Sheikh’s order in this matter then Burhan Uddin Gharib became upset due to separation from of the Sheikh. Many times many friends tried in this matter but the Sheikh did not accept any recommendation in this matter. When all endeavors were become unsuccessful then he was requested Amir Qusro in this matter and as he loved him very much so for this reason Amir Khusro put his turban on his neck and asked him to stay at the place where the footwear are kept. At that time the Sheikh was doing ablution while was putting his cap in the bent style on his head and when Amir Khusro saw the Sheikh then he recited one Persian couplet with which Hazrat Nizam Uddin Auliya was too much happy and he stood and took both of them under his shoulders and was renewed the pledge of Hazrat Burhan Uddin Gharib. In the reference from the book ‘Fatuh Auliya’ that on the day on which Hazrat Muntajib Uddin was dead in Khuldabad and on that day this event was happened that Hazrat Nizam Uddin Auliya was doing abulution and the Hazrat Burhan Uddin was there in his service while hold the water jug and he was pouring water for ablution for him. Hazrat Nizam Uddin Auliya asked him whether his brother was elder or younger with him.? So for this reason Hazrat Burhan uddin was able to know in this matter that his brother is no more in this world. On the next day he brought the goods which are required for Ziart (third day funeral rites) of his deceased brother Hazrat Muntajib Uddin and he came into the meeting place of his Sheikh. So all persons who were present there asked him in this matter. So Burhan Uddin told them that yesterday Sheikh asked him that whether Hazrat Muntajib Uddin was his younger or elder brother so by his wisdom he got this idea that his brother already left this world as word was referring to past tense. After the end of this meeting the Sheikh told him that he was selected him as successor of his brother in Khuldabad Sharif so you should proceed soon to Khuldabad. Upon his Sheikh’s order he was become silent and was upset with the thought of separation from his great Sheikh so he was sad in this matter. But due to manners and etiquette he did not say anything in this matter. Upon watching this condition and due to his silence in this matter the Sheikh asked the reason for his silence. So Hazrat Burhan Uddin told him that he will be left away from his sandals. So Hazrat Nizam Uddin Auliya told him to keep the sandals on his head and due to pain of leaving him and which was so severe that he was becoming uncontrolled in this matter and he began weeping in this matter. So the Sheikh told him why he is reluctant in this matter to go to Khuldabad Sharif. So he told him with humility and sincerity that he will be away from his meeting place. Due to his favor and attention he told him to took away all disciples and caliphs who were present in the meeting place at that time and to go Khuldabad along with them there. In the book ‘Fatuh Auliya’ it is mentioned that there were total 700 persons and some other historians says that they were total 400 persons who were present at the meeting place at that time. But Mohammed Qasim Farista has mentioned that they were total 400 persons . And also the following persons were also going to Khuldabad along with Hazrat Burhan Uddin Garib. As per spiritual master’s orders he left Delhi for his journey towards Khuldabad Sharif . At the time of departure the Sheikh awarded him the following which are mentioned as follows. Grace (namat) of innermost (batini). He was advised following five instructions which are as follows. To give the relics and saintly dress to Maulana Dawood Hussain (Syed Zain Al-din). To give preference to mothers’ willingness than other things and to think it as mercy of Allah. To perform five congressional and Friday prayers and never ignore these prayers. Always to be live as bachelors. To take care of my spiritual sister who is living in Doulatabad. Upon kissing the feet of the Sheikh he left from the residence of his spiritual master towards his journey to Doultabad. Hazrat Burhan Uddin Gharib along with his friends after covering many places and jungle areas and they found one village in healthy resort of jungle area so they stayed there one night in that village. At the side of village and at the bank of river Tapti he sat on the stone and made ablution and prayed in congressional and after his prayer he was prayed for one big city’s rehabilitation there and his prayer was accepted and one big city was rehabilitated there and its name is well known as famous as Burhanpur and he left from there after Fajar (morning ) prayer for his onward journey towards Deccan. After some days of journey he was arrived in Doulatabad which is also known and famous as ‘Baghe Roudah’ in the year 718 A.H. Or 720 A.H.
Due to his favor and his attention there were great benefits to the following persons in Doulatabad. Also a large number of persons become his disciples and devotees. The list of persons who came to Doulatabad from Delhi is very lengthy and if we try to write all of them then it will require a lengthy book on this matter so for this reason the details of names of pious persons are not included in this brief episode and only the details of events of Hazrat Burhan Uddin Garib are added in it. He was staying in Doulatabad for a period of 18 years upon arrival from Delhi. When he become 80 years old in the year 735 A.H. then he was becoming ill so for this reason the persons thought that he will be died soon. So when he heard this news in this matter then he told Abdullah Matbaqi that the people are reluctant for his illness but this time he will be recovered as his spiritual master has given me some things which are still pending with him. But during his next illness period which will be continued for a period of 3 years and during such condition by the grace of Allah I will be benefitted by night of power (Shabe Qader) and after that time I will leave this world and see the all Mighty Allah. It means he will be died during his second period of illness. Abdullah Matbaqi says that the Sheikh predicted his second illness details before four years and asked him not to say this secret to anybody. So during his life time I never disclose in this matter to anybody. So in this way he was recovered from his first period of illness. He was become ill again in the year 736 A.H. And during this period of illness he was used to weep some time. So the Sheikh’s disciples Khaja Mumbark Ghouri who was his disciple once he was in his presence so he told me that Mubark do not think that he is weeping due to fear of death or illness. But to reason of absence of remembrance of Allah for a while so he will weep in this matter. The lover of Allah never weeps for the following conditions. As the pious personalities used to think that illness and problems are a mercy from Allah. When his illness extended for longer period so the persons of manifest thought it is illness so they brought experienced doctors to check his health condition. So the doctors after checking his pulse beating told that his body was converted as the soul. So for this reason there is no cure available with us or even the other doctors could not able to cure him in this matter. Before his death he was in the following conditions. Due to the above conditions when any person will use to come there to kiss his feet then the servant will call the name of visitor. When his time of death came nearer when somebody will present there then he will give something to him and used to ask to leave him. Once he was distributed many coverlets. During his period of illness he was informed disciples about his death and place of his burial. At last days of his death he was called all his disciples one day and give them his special advises to them. Some time before his death he kept bead of Hazrat Nizam Uddin Auliya before him and wear turban on his head and he began saying as follows. There is difference about his date of death. As per saying of his disciple Mujad Uddin that on 12th Safar 738 A.H. on the Tuesday at the time of chast (mid-morning) prayer Hazrat Burhan Uddin Gharib called his servants and instructed them to go into the kitchen to eat the food from there. As per Sheikh’s instruction all persons who were present near him were went in to the kitchen for eating the food from there. Only Khaja Rasheed Uddin who was his disciple was there with him in his service. He told him where is the dress of our Khaja Sahib and to bring the same. Khaja Rasheed Uddin told him that the dress is kept in the room and he moved further to hear what the Sheikh will give instruction in this matter but upon watching him carefully and found him that he was already left the world. On that day the dead body was kept safely and on the next day on 13th Safar in the year 738 A.H. on the Wednesday treasure (Gunj) of secrets of Allah was buried. As per tradition it is known that he was died on the 8th of Safar in the year 738 A.H. So as per this custom every year his Urs (death anniversary) is celebrated on 8th Safar. 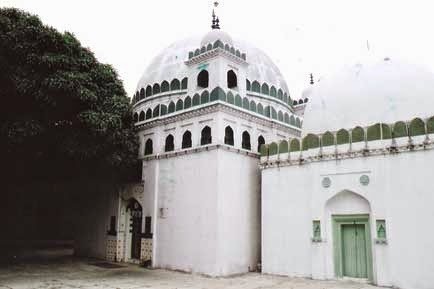 Hazrat Khaja Sheikh Burhan Uddin’s mausoleum is situated in Khuldabad Sharif which is famous and well known so the visitors from near and far away places in large number who will visit the shrine for the fulfillment of their desires and wishes for the sake of Shaikh’s name . There is grand mausoleum was constructed over his grave and in front side of tomb there is stone floor is available .On stone floor there are marks of silver nails available there. About silver nails it is famous in the shrine that when there was no source of income available to the servants of the shrine then at that time these nails used to grow longer so for this reason the servants used to cut these silver nails at a particular time and used to sell in the bazaar and used to cover the expenses of the shrine as well as they used the money for their personal house expenses. When system of jagir (estate) was started then the growth of silver nail was stopped and now only mark of the silver nails left on the floor of the shrine and the servants of the shrine point out the marks of the silver nails. The Urs (death anniversary ) ceremony. Every year on the 8th of Safar the Urs (death anniversary) ceremony used to commence in the shrine building. The schedule of programs are as follows. On the 8th Safar White washing. On the 9th Safar Farashan. On 10th Safar Sandal ceremony. On 11th Safar illumination of lights. On 12th Safar reciting of Quran and cover of the grave will be removed and will be taken for the washing at Satkande place. In the Urs (death anniversary) ceremony there is no large number of persons are found. It mean only local persons used to participate in the ceremony and all other ceremonies are held as per the Urs (death anniversary) programs of Hazrat Mutabjib Uddin Zar Zari Baksh. As status and position of the Sheikh was increased too much so in the same way his miracles were also increased. In his life history he performed so many miracles at different occasions. So for this reason it is not possible and it is hard task to mention all of them here in this brief episode. Due to this fact some miracles are mentioned which are as follows. Once a woman came there to see him upon suffering to severe pain in her head and due to this problem she was very upset and restless in this matter. She requested him and told him that she had severe pain in her head so please cut her head or pray in this matter so that she could find relief in this matter. When he heard her request he was smiled and told her that if the head will not be broken then her pain will not be gone. Upon hearing this she left from there to her house and she sat at the side of one old wall and at that time suddenly one stone was fell on her head from the upper side and blood was discharged from her head and upon this there was no more pain in her head. As per reference from the book ‘Gharib Karamat’ that once two persons came to see the Sheikh to pledge him but he was accepted one person for his pledge but he told another person that he had some doubts or suspicions in mind so he is no good for the pledge. So one should not visit the darvish person in that condition and it is not good so it will be termed as insolence in this matter. When the two persons left from the Sheikh and one person who become his Murid (disciple) asked him when the Sheikh did not accept you for his pledge and what is secret in this matter.? So the other person told him that there many ideas were coming in his mind at that time and some time it were coming to become his disciple and some time there were ideas in his mind not to become his disciple. Also there is necessity of bathing for him. One day one person came there to check the Sheikh and he sat there in cross legged position and started to discussion on some issue. So in that condition the Sheikh called him to sit near him so for this reason he was began shivering due to his discussion and for this reason his first idea about the Sheikh was left from his mind. In the discussion the Sheikh told him the details of events which were happened to him during the period of 12 years and his description were so perfect that as he was also present there and watched all events personally. In those past events he was also told him about his love story of a woman so for this narration that person was surprised in this matter and then he come become his disciples and pledge to him. One person who was known and famous as Taj Uddin who was having large family with him but his source of income was very less. Once he complained his problems with the Sheikh. So the sheikh told him that if Allah wills there will be available prosperity to him soon but at that time he didn’t live in the world. It is fact that it was happened as per his prediction. Once Fakher Haider came to see him and he had a thought in her mind that if the Sheikh is perfect pious personality then he will give him sugar-candies. So as per his thought the Sheikh was called his servant and asked him to give some sugar-candies and told Fakher Uddin do not take examination of the darvish persons. Khaja Ramzan says that once in his house all members of his family were become ill so for this reason his father sent one water pot to the Sheikh and instructed him to explain the details of condition of illness of all family members in this matter. So when arrived there and explained the details of illness to the Sheikh so he did blow over on the water and asked to give water to all persons except one persons. Upon reaching back his house he was given water to all persons except that persons so all patients become well and the person whom the Sheikh was prohibited to give the water was died. The Sheikh sayings are too many and some of them are mentioned as follows. The darvesh should not keep amant (entrusted things) with him and should not involve in the matters of surety and witness. The darvesh should remove the things which he had in his hand and in his head it means he should remove money and proud from him. The darvesh should not wear thin clothes. The world is like a shadow and when he will go towards it then the shadow will run ahead of him. When one person who will turn away his back from the world then it will come to his face side of him in the same way one who will turn his face toward the world then the world will to come to his back side and those who will turn away his faces towards from the world then the word will turn his back towards them. The goat will drink water without making wet of the feet while sitting on the support of the knees and when she will die then the skin of her body is used for water purpose and in the same way the human being not allowed any dust particles on his clothes but when he will leave the world then he will be buried in the earth.